Background: Despite different management strategies, progression of proteinuria occurs in a sizable category of patients with diabetic nephropathy (DN). Increase in serum renin levels induced by the renin–angiotensin system (RAS) may contribute to this. Vitamin D therapy is found to have an inhibitory effect on the RAS. 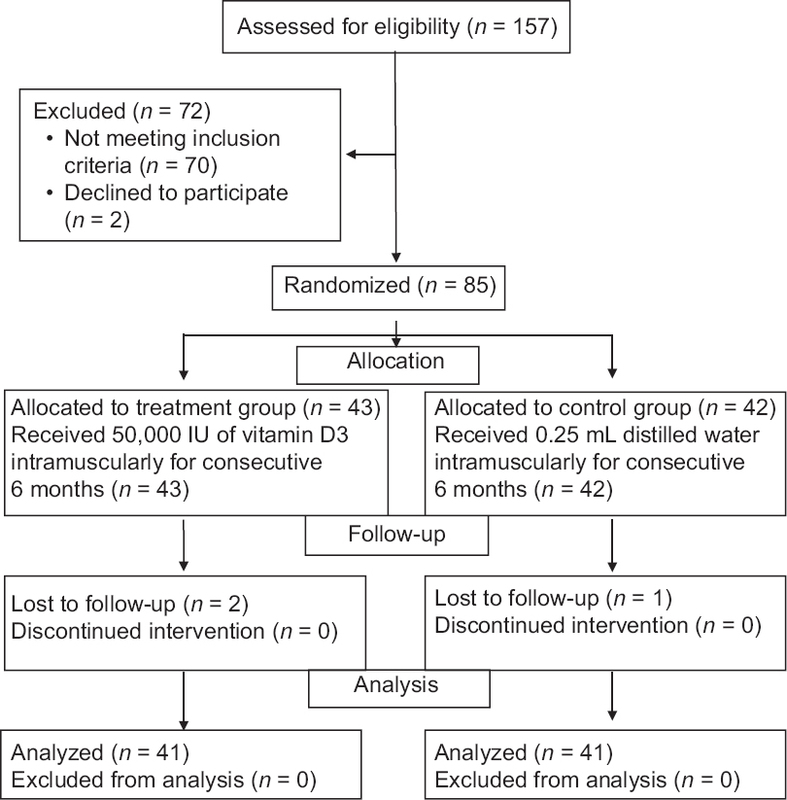 We aimed to study the effects of Vitamin D therapy on renal functions of patients with DN. Methods: This was a double-blind, randomized, placebo-controlled study. Patients with DN (urinary albumin [UA] >30 mg/g of creatinine) whose estimated glomerular filtration rate (eGFR) was more than 30 mL/min were selected and their plasma renin, parathyroid hormone, serum Vitamin D, serum calcium, serum creatinine, fasting blood sugar were done as baseline measurements. Subjects were randomized into two groups and treatment group was given Vitamin D, 50000 IU (0.25 ml) intramuscularly (IM) monthly for 6 months; control group received distilled water IM. Investigations were repeated after 6 months of therapy. Results: Of 155 patients invited, 85 were randomly assigned to two groups. After 6 months, mean reduction of UA to creatinine ratio in the treatment and control group was 51.8 mg/g (95% confidence interval [CI]; 66.1–−37.5, P ≤ 0.001); 22.4 mg/g (95% CI; −45.7–0.8, P = 0.06), respectively (between group difference P = 0.001). Significant increase in the eGFR observed in the treatment group while eGFR remained unchanged in the control group (P = 0.03 for the between-group difference). Mean reduction in plasma renin in treatment group and control group was 5.85 pg/mL (95% CI; −6.7–−4.6) (P < 0.001) and 0.95 pg/mL (95% CI; −1.4–−0.14, P = 0.02), respectively. Conclusions: Vitamin D 50000 IU given IM monthly for 6 months reduces urine albumin, serum creatinine, and renin levels in patients with DN. Background: There is paucity of information on epidemiology of mental disability in India. Objective: The objective of this study was to assess mental disability, and to study the association between sociodemographic and comorbid chronic conditions with mental disability. 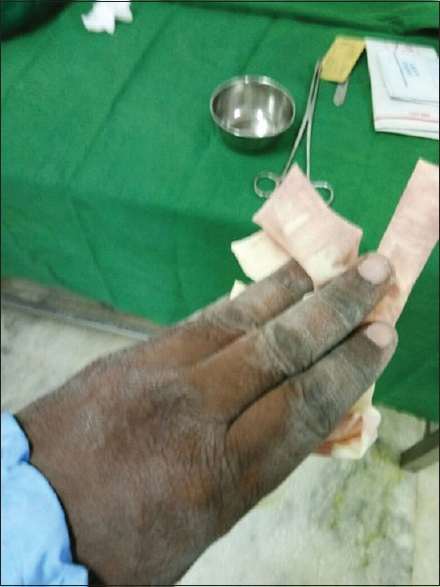 Materials and Methods: This community-based cross-sectional study was conducted among ≥5 years age group in an urban area attached to a Tertiary Care Medical Institute in Puducherry, India. Mental disability was assessed using Indian Disability Evaluation and Assessment Scale. Chronic morbid conditions and other associated factors were collected using pretested questionnaire. Statistical Analysis: Univariate and multiple logistic regression analysis. Results: About 2537 subjects were covered with a response rate of 94.1%. Overall, the prevalence of mental disability was found to be 7.1% (181/2537). Among them, majority had mild mental disability (151, 83.4%), followed by moderate (21, 11.6%), severe (8, 4.4%), and profound (1, 0.6%) mental disability. Univariate analysis showed that age group status, marital status, education level, occupation, family type, religion, hypertension, joint pain, backache, current smoking, current alcohol use, and conflicts were associated with mental disability (P < 0.05). Multiple logistic regression analysis showed that male gender (adjusted odds ratio [AOR] =2.064), widowed status (AOR = 27.022), separated/divorced status (AOR = 16.674), currently married status (AOR = 18.487), being illiterate (AOR = 4.352), having 1st–10th standard education (AOR = 2.531), being in an unskilled (AOR = 0.287) or semiskilled/skilled occupation (AOR = 0.025), belonging to a nuclear family (AOR = 1.816), and absence of family conflicts (AOR = 0.259) were significantly associated with mental disability compared to their counterparts. Conclusion: Mental disability is more common in this area. Males, lesser education level, skilled or unskilled occupation, nuclear family, and conflicts were associated with mental disability after adjusting other variables. Multicentric cross-sectional analytical studies will explore the mental disability burden and its associated factors at regional or country level. Background and Objectives: Although a number of studies have been conducted on the prevalence of hypertension (HTN) and diabetes on tribal populations in different parts of India, comparative tribe-specific information is very meager. The main objective of this study is to generate tribe-specific information on the noncommunicable disorders (NCDs) and associated risk factors in scheduled tribes (STs) in Coastal and Western Maharashtra. Methods: The study was conducted on 1864 (females 960) adults (≥18 years) of both sexes in four dominant tribes in the region, namely, Bhils (748), Katkaris (560), Kokana (352), and Thakars (204), using the protocols approved by the Institutional Review Board. The study areas were geographically separated by large distances (250–500 km apart). Prevalence of overweight, diabetes, HTN, and hypercholesterolemia was measured using standard field-based techniques described in our earlier publication. Results: All STs in this study are grossly underweight; the Katkaris are worst affected. The prevalence of obesity (body mass index ≥30 kg/m2), HTN (blood pressure ≥140 mmHg), diabetes (capillary blood glucose >126 mg/dl), and hypercholesterolemia (cholesterol ≥200 mg/dl) was 0.9%, 11.7%, 6.7%, and 0.6% respectively. There are no statistically significant inter-tribal differences in the prevalence of these parameters. Age and obesity appeared to be the most dominant risk factors for HTN. However, there is no clear-cut picture about the influence of risk factors on diabetes or hypercholesterolemia. Interpretation and Conclusion: The prevalence of NCDs is still very low in STs, probably due to near absence of the risk factors such as obesity, sedentary lifestyle, and hyperlipidemia. STs are highly endogamous, and the study areas are separated by large distances ruling out intermingling of tribes. Yet, there is no consistent inter-tribal prevalence pattern for NCDs. Although the sample size is small, the results support the view that environmental factors are likely to be more important than host genetics in the causation of NCDs. Background/Objectives: The possible relationship between smoking and risk of colonic diverticulosis has been suggested by recent epidemiological studies, although the results were inconsistent. 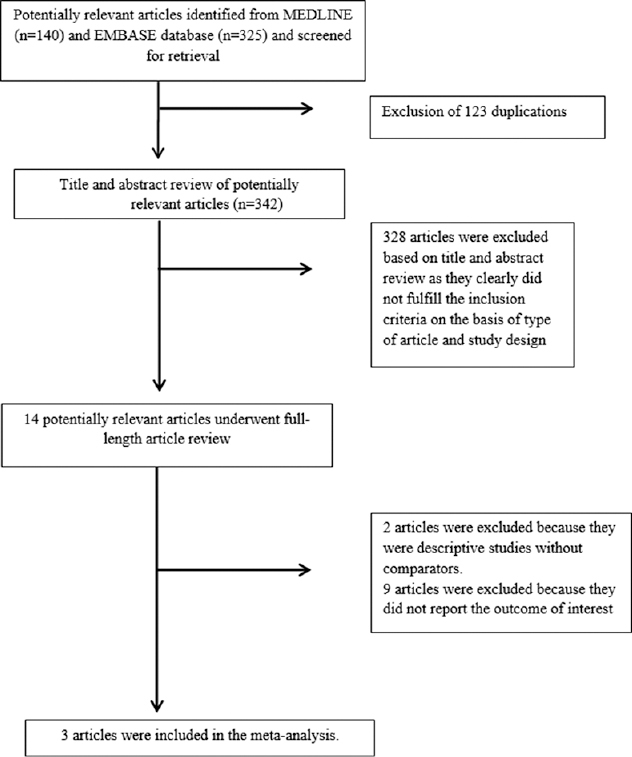 This meta-analysis was conducted to summarize all available data. Methods: A comprehensive literature review was conducted using the MEDLINE and EMBASE databases through May 2017 to identify all studies that compared the risk of colonic diverticulosis among current and former smokers versus nonsmokers. Effect estimates from each study were extracted and combined together using the random-effect, generic inverse variance method of DerSimonian and Laird. Results: Of 465 potentially eligible articles, three prospective cohort studies with 130,520 participants met the eligibility criteria and were included in the meta-analysis. The risk of colonic diverticulosis in current smokers was significantly higher than nonsmokers with the pooled risks ratio of 1.46 (95% confidence interval [CI], 1.13–1.89). However, the risk of colonic diverticulosis in former smokers was not significantly higher than nonsmokers with the pooled risk ratio of 1.13 (95% CI, 0.88–1.44). Conclusions: A significantly increased risk of colonic diverticulosis among current smokers is demonstrated in this study. Ultraviolet (UV) irradiation is one of the several environmental hazards that may cause inflammatory reactions in ocular tissues, especially the cornea. One of the important factors that affect how much ultraviolet radiation (UVR) humans are exposed to is travel. Hence, traveling is considered to include a more acute UVR effect, and ophthalmologists frequently evaluate and manage the ocular manifestations of UV irradiation, including UV-induced keratitis. The purpose of this paper is to provide an evidence-based analysis of the clinical effect of UVR in ocular tissues. 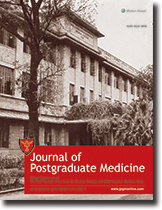 An extensive review of English literature was performed to gather all available articles from the National Library of Medicine PubMed database of the National Institute of Health, the Ovid MEDLINE database, Scopus, and ScienceDirect that had studied the effect of UVR on the eye and its complications, between January 1970 and June 2014. The results show that UVR at 300 nm causes apoptosis in all three layers of the cornea and induces keratitis. Apoptosis in all layers of the cornea occurs 5 h after exposure. 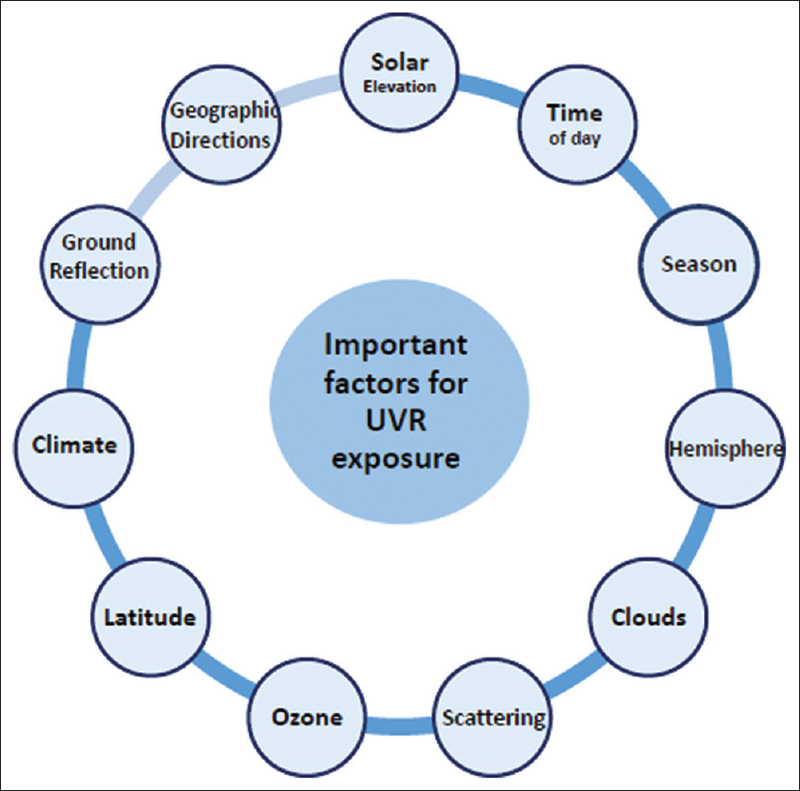 The effect of UVR intensity on the eye can be linked to numerous factors, including solar elevation, time of day, season, hemisphere, clouds and haze, atmospheric scattering, atmospheric ozone, latitude, altitude, longitudinal changes, climate, ground reflection, and geographic directions. The most important factor affecting UVR reaching the earth's surface is solar elevation. Currently, people do not have great concern over eye protection. The methods of protection against UVR include avoiding direct sunlight exposure, using UVR-blocking eyewear (sunglasses or contact lenses), and wearing hats. Hence, by identifying UVR intensity factors, eye protection factors, and public education, especially in travelers, methods for safe traveling can be identified. Ectopic adrenocorticotropic hormone (ACTH) syndrome is an uncommon disorder and comprises about 15% of all patients with Cushing's syndrome (CS). Duodenal carcinoids are rare, indolent tumors usually associated with a benign progression. 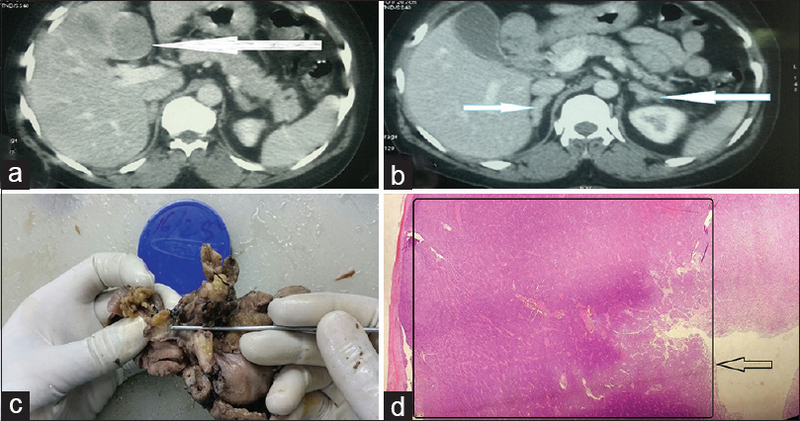 We hereby report a rare case of CS resulting from ectopic ACTH secretion from a duodenal neuroendocrine tumor (NET) presenting with liver metastasis. A 37-year-old female presented with abdominal discomfort and dyspepsia of 1-month duration. Ultrasound abdomen suggested a well-defined hypoechoic lesion in the left lobe of the liver, suggestive of neoplasia. On clinical examination, she had Cushingoid features and persistent hypokalemia. Midnight ACTH and cortisol levels were grossly elevated at 1027 pg/ml (n < 46 pg/ml) and 87.56 μg/dl (n < 7.5 μg/ml), respectively. Both overnight and high-dose dexamethasone suppression test confirmed nonsuppressed cortisol levels - 86.04 and 84.42 μg/dl (n < 1.8 μg/ml), respectively. Magnetic resonance imaging brain showed a structurally normal pituitary gland. Computed tomography scan of the abdomen revealed hepatic lesion with bilateral adrenal enlargement. A diagnosis of ectopic ACTH-dependent CS was made. 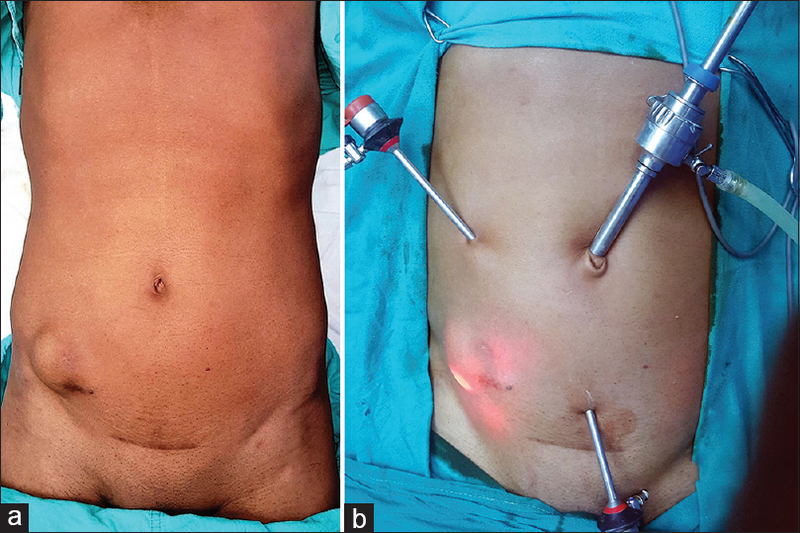 Intraoperatively, a duodenal lesion of 0.5 cm × 0.5 cm was identified alongside an 8 cm × 6 cm exophytic lesion in segment IV of the liver. Frozen section of the duodenal lesion was positive for NET. She underwent a Whipple's surgery, cholecystectomy, and left hepatic lobectomy. Postoperatively, she showed clinical and biochemical remission. Herewith, we report the third case of duodenal carcinoid tumor presenting as ectopic ACTH syndrome and the first with liver metastasis. Acute lymphoblastic leukaemia (ALL) presenting as peripheral blood hypereosinophilia is very rare and the incidence is <1%. The characteristic feature of patients with ALL and hypereosinophilia is the absence of blasts in peripheral blood, and this might lead to misdiagnosis of ALL. It is important for clinicians and pathologists to be aware of this uncommon initial presentation of ALL to avoid delay in diagnosis. We report a 37-year-old man who presented with fever and respiratory symptoms and was found to have hypereosinophilia in peripheral blood. His bone marrow and lymph node biopsies were diagnostic of ALL. We report a case of a 36-year-old man with a medical history of human immunodeficiency virus (HIV) infection who presented with hypomimia, hypophonia, bradykinesia, rigidity, and freezing of gait. His clinical presentation and magnetic resonance imaging were consistent with HIV encephalopathy with involvement of the bilateral basal ganglia and diffuse leukoencephalopathy. We initiated a trial of carbidopa-levodopa. The dose was escalated to 1050 mg levodopa daily. Amantadine was also started. The patient was closely monitored for behavioral, neurological, or systemic side effects. He tolerated therapy well without adverse effects. The patient's neurological status significantly improved with levodopa, including hypomimia, hypophonia, bradykinesia, and fluidity of gait. This case demonstrates that carbidopa-levodopa can be safely utilized to manage parkinsonism in an adult patient with HIV encephalopathy. Traumatic abdominal wall hernias (TAWHs) are relatively uncommon entities. Common mechanisms that predispose to such hernias include motor vehicle accidents, seat belt injuries, fall from height, handlebar injuries, and bullfighting. Bullhorn injury leading to TAWHs is an uncommon mechanism. We report here one such patient who was managed by laparoscopic transperitoneal anatomical repair of the defect using polypropylene suture. The patient recovered well without any complication and is being followed up. Such small defects can be managed laparoscopically and tissue-only repair using a nonabsorbable suture is a feasible option. Our case is the first reported case of bullhorn-injury associated traumatic hernia managed laparoscopically and first reported case of TAWH in an adult which was managed by laparoscopic sutured tissue-only repair. Childhood cerebral X-linked adrenoleukodystrophy (XALD) typically manifests with symptoms of adrenocortical insufficiency and a variety of neurocognitive and behavioral abnormalities. A major diagnostic clue is the characteristic neuroinflammatory parieto-occipital white matter lesions on magnetic resonance imaging. This study reports a 5-year 10-month old boy presenting with generalized skin hyperpigmentation since 3 years of age. Over the past 9 months, he had developed right-sided hemiparesis and speech and behavioral abnormalities, which had progressed over 5 months to bilateral hemiparesis. Retrospective analyses of serial brain magnetic resonance images revealed an unusual pattern of lesions involving the internal capsules, corticospinal tracts in the midbrain and brainstem, and cerebellar white matter. The clinical diagnosis of childhood cerebral adrenoleukodystrophy was confirmed by elevated basal levels of adrenocorticotropin hormone and plasma very long chain fatty acid levels. Additionally, sequencing of the ABCD1 gene revealed a novel mutation. The only specific palliative therapy that could be offered after diagnosis was dietary intervention. The patient died within 16 months of onset of neurological symptoms. Awareness that childhood cerebral XALD can present with atypical neuroimaging patterns early in its course may aid diagnosis at a stage when definitive treatment can be attempted and timely genetic counseling be offered to the family.